One of the best ways to make an ordinary day into a special occasion is to have a picnic. It can be elaborate or simple fare, and the spot you choose can be close by, or a few hours’ drive. You can find a secluded, quiet corner or settle in a nice shady area near a famous landmark. You can spread a blanket on the ground or use one of many picnic tables provided in parks, welcome centers and other public places. No matter what combination you choose, there is something refreshing and calming about sitting down to rest and eat in a lovely outdoor setting. Jeff is not quite as fond of picnics as I am, but he is wonderful at packing for them. Sometimes when I plan a picnic with a friend, he will offer to pack for us, and it’s a great surprise to unpack it later and find what is waiting for us. He always errs on the side of too much food and too many choices, which is delightful. Fruits, cheeses, crackers, nuts, those delicious imported cookies dipped in chocolate, sparkling juices and several types of sandwiches (with lettuce and tomato packed separately to prevent soggy bread) are just some of the things I tend to find in any basket he’s packed. Springtime is a great season for picnics, before it gets too hot and the insects are out in force. I hope you will have at least one festive picnic or cookout in the next few weeks. It’s a good way to have fun that doesn’t involve some sort of electronic screen, and doesn’t cost a lot of money. If you take along a camera and send us a photo, I’ll post it here. Bon appetit! i’ll be meeting a group of about 20 on friday for a picnic, and i had also been entertaining the idea about a post that showed that one didn’t need a lot of money to have a ‘well-dressed’ table to share with a good friend or two… over the next week i hope to have a post about both, and i will definitely link those back to you! Thanks so much! I will look forward to your post. It will be more challenging with 20, but also more fun – the more the merrier! Lynn, I just love to eat out on the deck, although we don’t do it nearly often enough to suit me! It does feel special. I’m so glad you were able to enjoy it before the weather turns hot there. Thanks for being here! What a terrific idea! Since we have ants inside our house, they won’t be as annoying outside. We also have a houseguest this week so maybe a picnic lunch is just the thing. Barb, I hope you are able to enjoy a nice outdoor meal. Whether it’s a feast or just snacks, it’s fun! Thanks for visiting here. Thanks for the reminder about picnics. It has been a while. That was something I associated with a time the kids were around and now as “empty-nesters” picnics seem to have diminished. Hi Mike, thanks for the great quote – I might have to use it here sometime! I’m flattered you thought of me when you read it. I hope you are able to enjoy a picnic soon! I’m ready to have a picnic with you all, if Jeff packs. Terry is not a picnic fan but will give in to me. We are getting ready to head to North Carolina to see Jennifer and family. Our grandson,Liem, will be “16” may 8th,so we decided to pay a short visit to them. Maybe I can talk them into a picnic. You all have a great week-end. Love and hugs. Wow, Carolyn, it doesn’t seem that long ago that we heard of Liem’s birth. Time really does fly. I hope you get your picnic! Terry and Jeff are good sports, aren’t they? Have a lovely trip to NC – we really like it there. Also thanks for continued prayers. Oh-I forgot to ask,”Why did your hometown reject the Carnegie monies for libraries. Never heard of that. Mike, I am unfamiliar with the rejection of the Carnegie money; is this something that happened recently? I did a quick online search but couldn’t find anything on it. Please give us an update on Rachel when you have a minute. We’ll keep praying for you and your family. Bindu, if you ever come to the USA, or I come to India, we shall have to get together for a picnic! Such a fun photo with the bridge in the background! Thanks Cee, I’m so glad you like it! 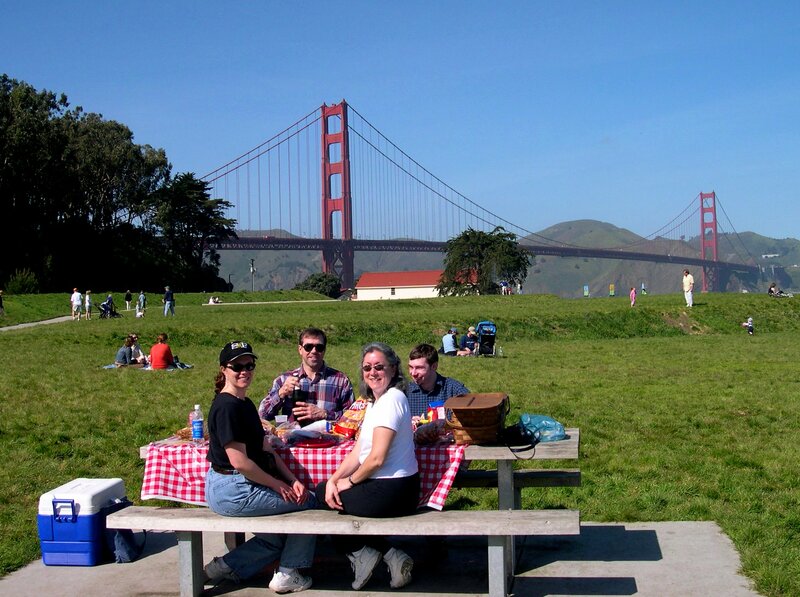 Looking at it makes me miss living in northern California, but picnics are fun everywhere. Thanks for the great ideas at Cee’s Fun Foto Challenge! Julia, you make me want to dust off my picnic basket, fill it with goodies, and GO! I guess our camping is like a picnic, but different. We do have a picnic table and we grill and eat outside with our camper friends often. I guess breakfast outside is my favorite. Bill says it’s just so therapeutic! It really sounds as though Jeff has mastered Picnic 101…. what a guy. Sheila, camping is like a super 24/7 picnic! I cannot remember when I’ve ever eaten breakfast outside, but I think a good breakfast is my favorite kind of meal so a picnic breakfast would be really fun. We are doing well, but Daddy has been in the hospital in Atlanta this week. He has COPD and has been on oxygen. They have ruled out heart problems and we hope he will be home soon. In California our preacher used to say “God is good” and the congregation was expected to respond “all the time!” I know that in my head most of the time but for me, in spring it’s easier to rejoice in all circumstances. Thanks so much for your prayers and for being here! Thanks Sheila, I miss having him here, too! All four of his children have always loved talking with our Daddy. Even though we are in our 50’s and 60’s now, we still rely on his wisdom and unconditional love. Thanks for being here! Hope you have a lovely day too. OH, what a surprise! Thanks for this Julia. We just drove over the bridge on Tuesday, drove up to Muir Forest which was so gorgeous. We were on a wine tour yesterday and had a picnic in a vineyard….stunning. Today Mr B and I are just toddling around and plan to stop at Bistro Don Giovanni’s for a little picnic after our drive thru the valley to Calistoga. I took a picture of Mr B at the bridge. But we couldn’t stay long because we couldn’t get a parking tag out of the machine? Wow, I am getting homesick for the NorCal Republic just reading your comment. I never did take a mud bath at Calistoga but I loved driving through there. I would wish you sublime weather but I know you are having some since it’s past rainy season! Are those hills still a beautiful green? Actually it’s pretty brown around here and it was 92 yesterday and today. We enjoyed our drive thru the little towns and really loved St Helena. It’s plenty HOT here! Yes, I should have known it couldn’t still be green in May, I just have a hard time imagining that it’s actually May already. I guess the green is gone by the end of March. The wildfires have already started so it must be pretty dry already. Keep in mind that it’s always hotter in Napa/Sonoma than in San Francisco – I used to say that we were an easy drive to different weather when we got too hot or cold. SFO can be really chilly this time of year! Julia, I feel so honored that you included me in you’re blog! When I go down memory lane to my visit with you, Jeff & Matt, this is the picture that comes to my mind. I had such a wonderful time that day. I want you to know that getting to spend time with Matt has always been very special to me. Blaine & I are taking our second grandchild, Colton, to San Francisco in July. I had envisioned taking him to this spot for a picnic. When we do, I will carry this memory with me also. Sending my. love to you & Jeff. I know God has you wrapped in His loving embrace! Hi Connie, I meant to send you an email “warning” that you would soon be starring in my blog, but life lately has been very hectic. I’m so glad you saw this. Very happy memories! I hope you guys have a great time in San Francisco, and since I left at least a little of my heart there, I’ll be with you in spirit! Thanks so much for being here. That would be so cool to have someone pack your picnic lunch for you and a friend. I just love the notion of that. Yes, it is a nice perk. It’s more fun when you don’t know exactly what is in that basket. It’s one of many things I love about my husband that have become even more dear to me since his stage IV diagnosis. I am praying we will be able to enjoy more picnics together. Thanks so much for visiting here, and for your comments! It’s like looking at the world through a lens. I understand. Bless you both.